Hello CP fans! Jessy is here today to share a little peek at my humble craft room. I'm blessed to have a room just to myself. Before we shifted into our house, we got the cabinet installers to design storages that I can store my scrapbook products especially the 12"x12" patterned papers. I'm glad that these cabinets turned out well and practical. I love how the white, gold + mint go so well together too. Those Crate Paper Craft + Office storages are still one of the best things I ever had! They are very practical and looks pretty stylish too. Here's the view of my desk where I use it for creating my projects and also for me to use the desktop for blogging & photo editing. This IKEA cart I bought a while back and it is indeed a perfect addition for me to store my tools. I can always push it around or add more things onto it whenever I needed to. That small & large black and white checkered magnetic boxes are great to use as part of my desk display or to store pretty trinkets/embellishments or simply use it to keep ready handmade cards/tags for that special one. I also love using projects that I have created as part of my craft room decor. It sure gives the personal touch to my craft room. These desktop organizer are the best! I love arranging new scrapbook collections in them. The compartments fit many products pretty well too. On these longer drawers, I keep most of my stationeries here and also things that I use frequently ie: photo printer, paper trimmer, journaling bible, etc. TIPS: Things that are within reach sure encourage me to use it even more. I do switch things and the products around whenever I feel I'm lack of inspiration. Sometimes just rearranging the supplies gives me the instant creativity boost! These cute little nesting containers are perfect to display little projects like cards and mini albums or even storing little embellishments. I love that my daughters and I can just pick the mini albums out and have a look again! Here you have it! One of my favourite room in the house! Thanks so much for letting me share my craft room with you. Have a great crafting day at your end. Hello everyone, its Bea here and I’m back with a new project using the Here and There collection. This time I decided to create a memory box to document our vacation in New York. When creating scrapbooking projects it is not unusual to see stitching as my focal element. I love the ‘handmade’ look it gives to my projects. I must admit I don’t spend hours stitching complex swirls, but I’m usually drawn to needle and thread when I want to highlight something on my page. This is evident on this project, where I used the Guide pattern paper as a base and stitched a line from Europe to New York to represent our flight. I also stitched a red heart around NY and added NYC letters from the rub-on sheet. The rose gold cardstock airplane on the line is just perfect!! When I finished the stitching, I placed the paper into a wood frame, and started adding my photos and memorabilia. I layered envelopes, cardstock stickers and ephemera pieces to the bottom of the paper. The envelopes are perfect for holding memorabilia and additional photos. I placed two photos into black and white puffy sticker frames, and arranged them under the stitched heart. I added my journaling to an ephemera piece with a post card design. I decorated the top of the frame with the Explore and the keyring cardstock stickers. To add more interest, I hung a green tassel on the ring. Hello everyone. It's Enza and today I'm sharing two hand-stitched cards with you. Stitching has always being a passion of mine, especially on paper. I love the extra detail it adds to scrapbook layouts, mini albums and, like in this case, cards. The first card features a stitched background. I often try to find geometric patterns in a collection that are simple and easy to accent with some stitching. Here I used one of the patterned papers from the Flourish 6x6 paper pad. I went for a tone-on-tone look, as I wanted the stitching to be subtle but still noticeable. Once the background was ready, I layered a few more papers behind the front panel, making sure to coordinate them with the colors in the embellishments I was going to use. The embroidered bird is so beautiful, I had to use it on this card! I popped it up with foam dots and arranged a few golden puffy sticker leaves behind it. The sentiment, which I fussy-cut to make the scalloped border more visible, comes from the sticker sheet. To balance the bottom left corner of the card, I also added two mini tassels in the opposite corner. I just tied them together with some twine that I wrapped around the top fold. For the second card, I went with a stitched sentiment. This was a little more time consuming than the first one, but totally worth it. After die-cutting the words, I adhered them on the front panel and stitched around them. I opted for blue thread to give it more definition and separate it from the busy background. I layered the heart with white cardstock to make it stand out more, and finished the card with two butterflies. Thank you for stopping by today! I hope I have inspired you to add a little bit of stitching to your next set of cards. Supplies: Flourish – 6x6 Paper Pad (344384), 6x8 Paper Pad (344406), Embroidered Patch (344392), Mini Tassels (344399), 6x12 Sticker Sheet (344385), Gold Puffy Stickers (344388), Standouts (344396). Welcome the Crate Paper blog. It's me Sandra and I'm sharing a new layout inspiration with you. Today's layout features two main techniques: stitching and paper weaving. First, I created the background for the layout. I used a cutting machine to cut evenly-spaced slits on the white cardstock background. In addition, I cut several paper strips from a patterned paper from the Flourish Collection. Then I weaved the paper strips vertically across the slits, going over and under the slits. For the title, I cut the word 'hello' from patterned paper and also from white cardstock. I glued the two pieces together with foam pads. I attached the cut-out words so that the white cardstock is placed a bit offset underneath the patterned paper title. Next, I cut the title 'every moment matters' with my cutting machine. Then I used a pair of scissors to cut this into a square title embellishment. In a next step, I added the photo and some fun chipboard stickers onto the layout. In a final step, I sewed around the edge of the woven background and also around the far edges of the white cardstock background. I used white sewing thread and my sewing machine. I hope you like my layout inspiration. Maybe you will try to stitch and weave on your next paper project too?! It's fun and the effects are really awesome. Hello! It's me, Sandra, and I would like to share a cute mini album project with you. It consists of a box with a see-through window and a mini album that is made from one piece of patterned paper. I scored a 12x12 piece of patterned paper by making two scores at four and eight inches. Then I rotated the paper and scored again at four and eight inches. Next I cut the four corner squares as shown in the following picture. On the left and right sides of the center square, I scored at about 1 cm each. This makes the album thicker when folded together. That way, you can add more photos and embellishments. I folded the flaps and created four pockets. Before gluing and sewing the pockets together, I added two pom pom garlands at the far left and right side of the mini album. I used double-sided tape to adhere the garlands to the patterned paper. Then I added photos and some fun word stickers. I particularly like the sewn edges. They add a visual interest to the mini album. The pockets are perfect for holding square journaling cards to go along with the photos. Now, I folded the mini album and tied a black ribbon around it. And I added two tassels and a metal charm for decoration. In a final step, I backed the see-through window with acetate and decorated the box with fuzzy cut flowers and embellishments. The mini album in a box is a nice gift idea. You can create a blank mini album and give it to a friend. They can add their own photos and journaling. I hope you like my mini album inspiration. Have fun creating today. Hi Ladies! It’s Flóra back today. My newest scrapbook layout was created with a super colorful Good Vibes collection. This time I picked a family photo to document. I love this photo so much because nobody is missing from it. I choose Hashtag Paper for my background because it is natural, perfect for base. I placed my photo in the middle and embellished around. This is always the best part. It’s so much fun the go through your beautiful stash and find the perfect place for the goodies. I used many Die Cuts, Chipboard and Cardstock Stickers. I placed them mish-mash to match the happy „messy” family theme. I layered all the pieces on each other, for some embellishments I used foam dots to create dimensions. I really needed some cute houses so I fussy cut them from Perfection Paper. They represent our home. My favorite embellishment on this layout is the die cut bird. I added a lovely a charm as a necklace. I also love the Together gold glitter Thickers what in person shines so beautifully. I completed my title with ’love’ Puffy Word. Love how characteristic is this sticker. In the end I pull out the cool Good Vibes Stamp Set and my black ink to add little phrases here and there. The layout is very simply but brings back all the memories and shows our colorful and happy family. Good Vibes collection is perfect for many-many themes, it’s a real jolly joker. That was it for today! Thanks for stopping by! For this mini album, I kept it very simple and built my base pages using one piece of patterned paper called Anne. I trimmed 6 pieces of 4"x5" to play with. The cover photo, I used the Grandiflora patterned paper. I felt it is really pretty with the pink pastel stripe as the cover against all the pretty die-cut shapes and stickers. For the cover, I chose this really cute house die-cut shape as houses truly represent home. And I added our family hashtag (#thamsupfamily) too, just above the door. Giving it the personal touch as well as the sentiment for the cover page. Layering those cute floral die-cuts along with the stickers sure gave alot of textures to the cover. I really liked that! I kept each page very similar with the idea of completing the mini album in the shortest time possible. Photo towards the left side and layering of embellishments on the right. I don't always get the luxury to complete my project in one sitting, the life of a stay-at-home-mama but I always looking forward for precious moments like these! Adding various kind of stickers sure create the little dimension I was aiming for! I just love to run through my fingers on every details on my pages. Once again, thanks for coming by! Hello everyone! Enza here, and today I'm sharing my very first layout featuring the new, gorgeous Wild Heart collection by Crate Paper. I love the vibrant colors and fun patterns of this line; it is versatile and perfect to document your everyday moments. I decided to heat-emboss some leaves with copper embossing powder as I wanted them to match the warm colors of the other elements. I also stamped a few in a light pink color ink, again to coordinate with the rest of the collection. In order to create a cluster on one side of the photo, I layered the fussy-cut images with die-cuts and stickers. Everything was adhered down with foam dots for dimension. A fun rosette ribbon completed the cluster. For the background, I cut the Planted patterned paper somewhat in half, following along the lines of the design and placed it in the top portion of the page. I love all the fun and colorful die-cuts that come in the ephemera pack. Here I layered a few of them behind the photo; I also arranged stickers and the “love” paper clip to form another cluster on the right side. The glitter foam stickers are perfect to add sparkly details here and there on your page. I used the “Favorite” sentiment as my title, and added the big butterfly at the bottom to give a “finished” look to the design. To balance the layout, I layered a few more elements in the opposite corner of the page; a mix of stickers, die-cuts, foam elements that bring in lots of texture and interest. I hope you enjoyed reading about my process and will feel inspired to start creating with the new Wild Heart collection. Supplies: Wild Heart – Planted (344424), Stamp set (344443), Ephemera Pieces (344436), Glitter Foam Stickers (344438), Paper Clips (344440), Standouts (344439), Stickers (344435). Hello Crate Paper friends! Lorilei here today sharing a layout made with the brand new Wild Heart Collection! I love this collection! The tropical vibe is trendy and the patterned papers are so much fun! I was really pulled towards the pinks and started out with a bold background. To tone it down just a bit I added a piece of white yardstick with simple circles cut out of it. I love how the patterns peek through! I added some lines of machine stitching and gold splatters to finish it off! The stay sassy frame from the ephemera pack started this whole layout. I couldn’t ask for a better sentiment for a teen photo! I layered a pink wild at heart standout next to the title and added a much love sentiment from the sticker sheet to make a little title cluster! The love epoxy clip is so cute!! I tucked it onto the side of my photo near the title cluster. The cut apart papers are always one of my favourite items. The cards and tags are great for layering or for using as a focal point. I chose to use the “hey” cards and tags tucked in and around my photo on this layout. I also cut the co-ordinating tags to tuck in as well. If the saying on the card doesn’t go with the theme of your page you still get the pop of pattern or colour! I love it when there are stamps in a Crate Paper collection! The Wild Heart stamps make the collection go even further with the addition of the leaf stamps. I stamped the two larger leaves with black ink on white card stock and fussy cut them for this layout. If you look closely you can see that I layered the ephemera prize ribbon under the standout for a subtle detail! Thank you for joining me today, I adore how my page turned out! Keep a lookout for the Wild Heart collection! Hey Crate fans! We have a special surprise today for you! 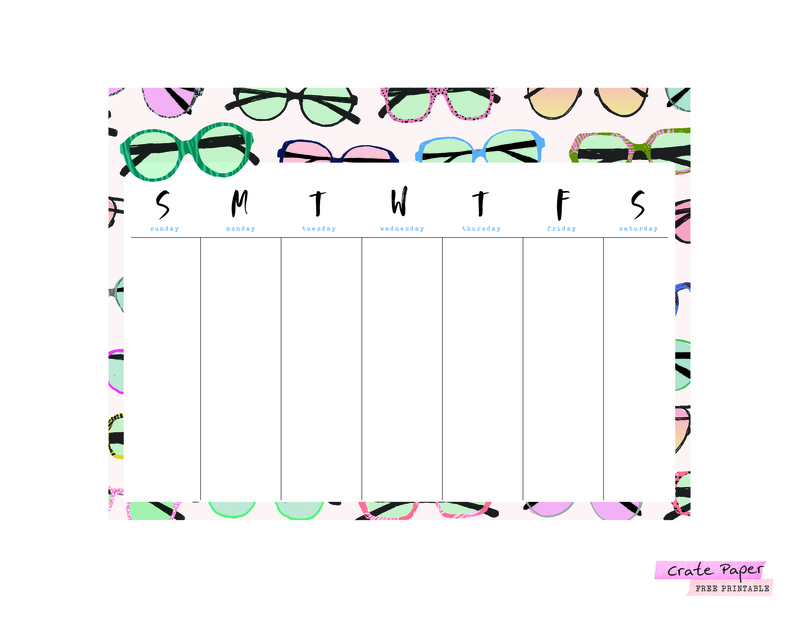 We're offering this free printable that will be perfect for tracking your weekly tasks and appointments. It's adorable on its own, but you can definitely embellish it and make it yours. Download it here.